Outside of water traveling through cracks or other openings the simple reason foundations leak is that concrete is very porous and all the foundation elements are underground. Dampness and flooding is caused by the following: the failure of an existing external waterproofing and bridging/wicking due to the raising exterior water levels below and beside the foundation. The building process dictates a few things. One, that a footer must be poured level and dried before the wall can be either poured (in poured concrete) or set (as in masonry block). 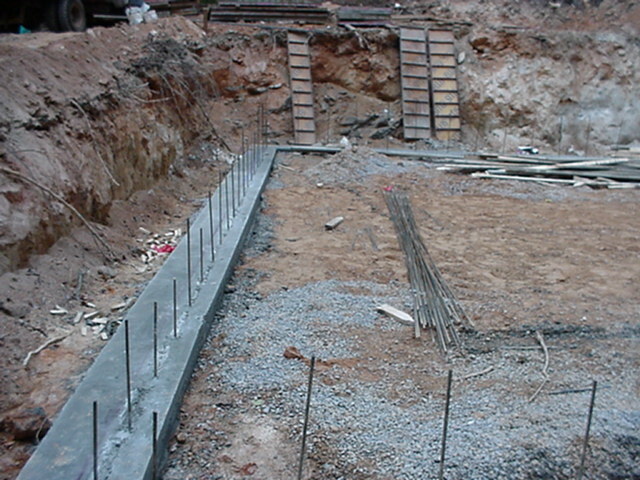 Once the footer is poured (see the image below) and dried then it is ready to support the foundation walls. There is only one problem. Once the footer is poured and dried any other concrete that is added on top of it will not adhere to it completely. This lack of adherence between two differently cured mixes is called a “cold joint”. As the new wall dries it forms a seam running the entire perimeter where the floor/wall/footer meet. When this seam is placed more than a few (4-18 inches) under ground it will leak water quite easily given enough water movement around the foundation. It is apparent when looking at the image above of a poured footer how low the basement floor will actually be. It will actually rest on top of that footer. In a heavy rain there will easily be a couple of feet of water in that hole. This water sits directly on top of the footer and wall seam. 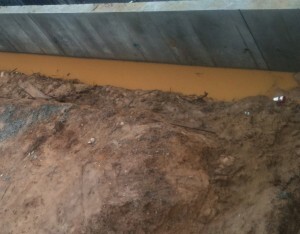 The below image is just prior to the back filling of the dirt next to a new concrete wall. Even after back fill there is still a tremendous amount of water against the wall after a rain. Adding the dirt does not remove the water that will stand there it only increases the overall pressure on the wall.